Adult-onset diabetes (Type 2 diabetes) has become virtually epidemic in America and other industrialized nations of the world. More than 135 million people worldwide have diabetes. Some 16 million Americans have this disease and it is believed millions more have it and don’t know it. The American Diabetic Association shows diabetes to be the forth leading cause of death in America. Since this type of diabetes has become increasingly prevalent among teenage and even juvenile age young people, some have dropped the moniker “adult-unset” and simply refer to it as Type 2 diabetes. Type 2 diabetes can largely be traced to the over consumption of refined carbohydrates. Such carbohydrates are broken down quickly into glucose in the digestive process and require large amounts of insulin from the pancreas. Insulin is the hormone produced by the pancreas that is responsible for transferring glucose from the blood into the cells. Type 2 diabetes occurs when the cells of your body gradually become resistant to insulin. When cells fail to react to insulin, glucose is rejected by the cells and remains in the blood stream creating elevated glucose levels in the blood. Excess blood glucose interferes with blood circulation which leads to poor wound healing and deterioration of organ systems such as the kidneys. Because of its damaging effect on the circulatory system, high blood glucose levels can lead to diabetic retinopathy which is damage to the retina of the eyes. This can lead to loss of eyesight and blindness. Restriction of blood flow can cause diabetic neuropathy which is nerve damage. Diabetic neuropathy can produce numbness, pain and even lead to amputations due to the dying of tissue. Heart disease and stroke are common complications of diabetes. Diabetes is sustained high blood sugar. A person is defined as diabetic when fasting blood glucose levels are above 120 milligrams per deciliter (mg/dl) of blood. Some health care professionals feel that any fasting blood sugar above 100 mg/dl is diabetic. Because of the risks associated with high glucose levels, have your doctor do an A1c test (AKA: HbA1c). This test is able to measure the amount of hemoglobin in the blood that has glucose attached to it (glycated hemoglobin). Hemoglobin is a protein found inside red blood cells that carries oxygen to the tissues of the body. This test is able to measure a person’s average blood glucose level over the past two to three months by measuring the percentage of glycated hemoglobin. An A1c level of 5.7 percent is considered normal. An A1c between 5.7 and 6.4 percent indicates pre-diabetes. When the A1c is 6.5 percent or higher, diabetes is indicated. While diet and other lifestyle dynamics are important to blood sugar control, there is something you can do immediately to regulate glucose levels. The company EuroPharma (Terry Naturally) recently introduced a supplement called Sucontral D which has been shown to be very effective in bringing down A1c scores. Sucontral D features a botanical extract from a desert tree called Hintonia Latiflora. Hintonia Latiflora has been clinically studied in Europe for over sixty years and found to be very effective in lowering blood glucose levels. Clinical work with Hintonia Latiflora found it to be equal or better than diabetic drugs in mild to moderate cases of diabetes. Some research has shown that patients using Hintonia Latiflora were able to eventually discontinue using diabetic drugs such as Metformin. In one clinical study, participants with Type 2 diabetes were given Hintonia Latiflora combined with vitamins B1, B6, B12, folic acid, vitamins C and E and the minerals chromium and zinc. The results were outstanding. Fasting and postprandial (after a meal) blood glucose numbers were reduced, A1c levels decreased and, as a side benefit, cholesterol and triglyceride levels came down as well. Hintonia Latiflora appears to work by delaying the release of sugars into the bloodstream. Research has shown that Hintonia Latiflora inhibits the enzyme alpha-glucosidase that releases sugar from foods. Hintonia Latiflora also has a number of polyphenols including one named coutareanenin. Coutareanenin appears to play a major role in the glucose regulating effects of Hintonia Latiflora. Polyphenols are plant chemicals that provide a variety of health benefits to the body. 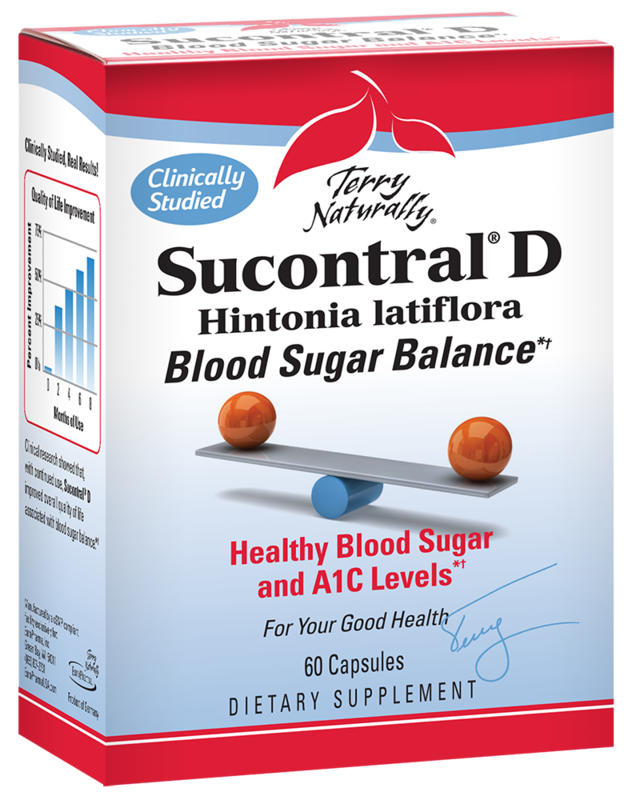 If you are diabetic, pre-diabetic or tend to regularly eat processed, refined carbohydrates, we recommend using the product Sucontral D. This product contains a standardized extract of Hintonia Latiflora along with the vitamins and minerals used in the clinical study discussed above. For more information on how to deal with diabetes from a nutritional perspective, go to: http://www.milkandhoneyhealthfoods.com/dealing-with-diabetes-from-a-nutritional-perspective .